The following video and blog post comes from a webinar that took place on April 14th, 2016. Today we're going to look at user retention strategies across product, analytics and email—three tools that you can use together to keep users coming back for more. First is Jackson Noel. Jackson is the Co-founder at Appcues, where he helps non-technical customers engage their users by letting them build in-product experiences for user onboarding or feature announcements without writing any code. Next we have Alicia Shiu. She is Product Marketing Manager at Amplitude, which is an analytics platform for mobile and web. 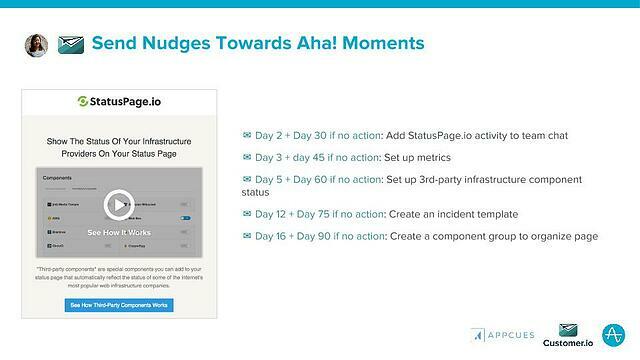 Amplitude allows your entire company to access and understand your user behavior so that you can drive engagement, retention, and growth by first getting users to your aha moment. Janet Choi is Marketing Manager at Customer.io, which is a behavioral email platform that harnesses user activity and profile data to trigger targeted campaigns at scale. Let’s format the conversation as follows. We’ll take just a few more minutes to set things up and introduce and a few high-level concepts. 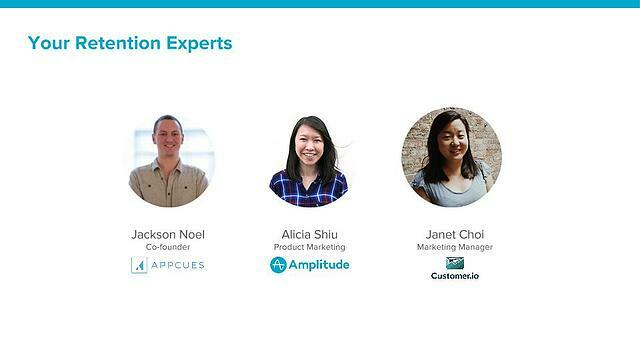 Then we’ll go through the three stages of user retention in which each of our speakers will take a turn in giving their unique perspectives, Jackson from Appcues will speak on product, Alicia from Amplitude on analytics, and Janet from Customer.io—email. 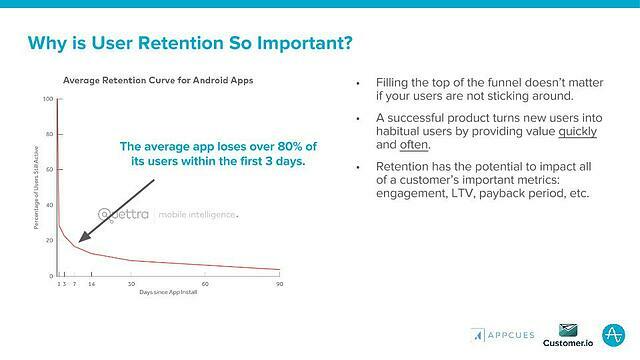 Why Is User Retention So Important? With the average app losing over 80% of new users in its first three days, it’s no wonder everyone’s thinking and talking about user retention. It’s painful to pour so much money and focus into the acquisition side of the funnel when it’s clear that there isn’t enough stickiness in your product to make this your most viable investment. Now, when products can provide immediate value to new users and then continue adding value with each subsequent login, they are sure to create habitual users. And habitual users will affect your business's bottom line metrics. 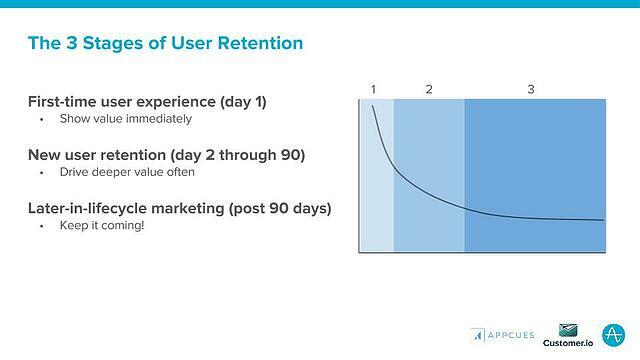 User retention is commonly broken into three stages. Your first stage is for your brand new users. Here we’re talking people who have just signed up for your app and are exploring it for the first time. And your goal in this stage, as a product owner, is to create an experience that gives them the impact of immediate value. Stage two—as we’re defining it—includes users between days two and ninety. And at this stage your goal is to drive them towards becoming a habitual user. 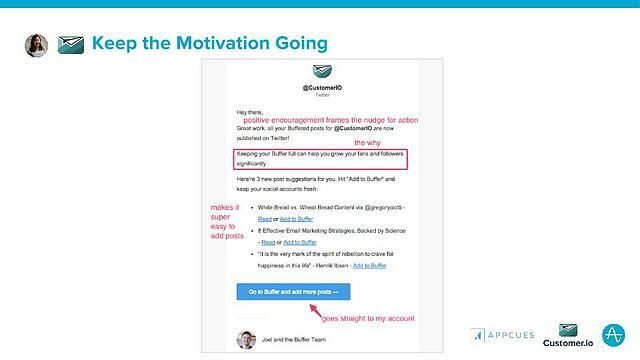 And after ninety days, successful user retention comes from keeping your users motivated. 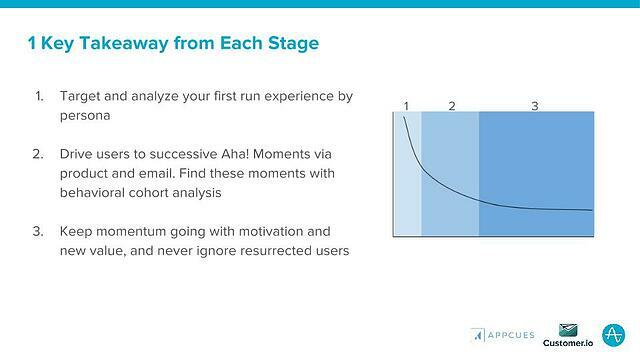 When you think about your first run experience, your goal should be to get users to their aha moment. You may be asking, what is an aha moment. Well, your product exists to make something something in your user’s life easier, faster, cheaper, more fun or what have you. 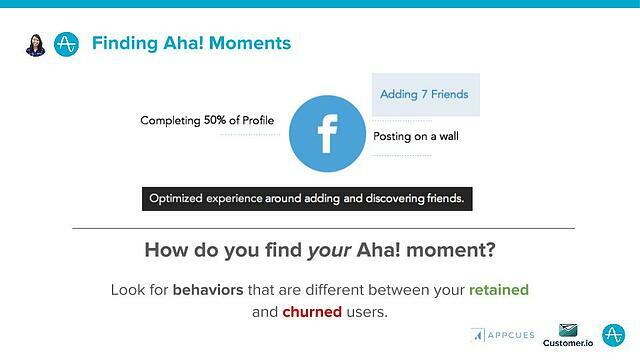 Your aha moment is the first time that users truly feel this improvement. It isn’t when they are necessarily reaping all the rewards for your product. That may take weeks or months of continued usage. But it’s when they first get it. Importantly, if you have different types of user personas signing up for your app they may have very different motivations and therefore different aha moments. And that makes it very important on the very first day or the first moment either on the sign up form or in your onboarding experience to get that data. For instance at Appcues we have marketers, PMs and engineers all signing up for our product. And what they care about and what their aha moment is is very very different. It’s important for us to know who they are so we can take them down and specific path to that's going to get them the value that they were hoping to get out of the product. Here’s an example of how Canva does that. 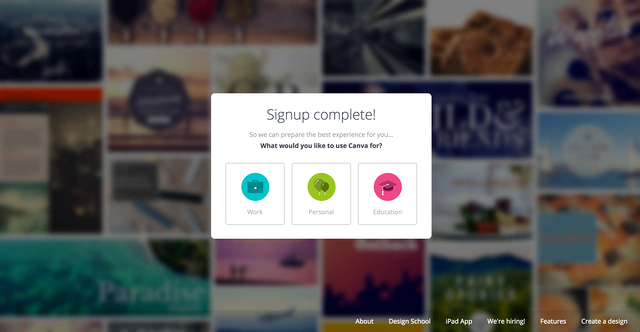 Canva knows that users who sign up for personal usage, for school or for work all have different motivations and goals. By asking for users to volunteer this information up front, Canva is able to curtail the first run experience to get each type of user to their aha moment quicker. After you have that information, we recommend building a flow that leads them right to that aha moment. It’s important to walk them through your product so they know how to use it correctly. There’s also a delicate balance between showing too much and slowing down. 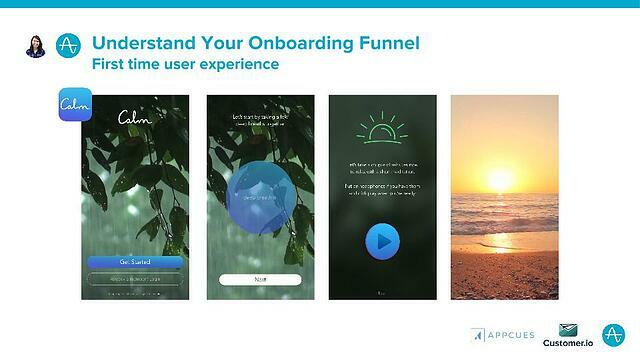 Now we’re going to talk about measuring your first-time user experience and onboarding funnel. When you’re thinking about this funnel, you want to include any key steps that users need to get through from opening the app to “activating”, or doing some critical action. Here’s an onboarding example from one of our customers, Calm, who have a mobile app for meditation. Their first-time experience includes an intro screen, then a breathing exercise, and then asks the user to complete a short meditation session. All of this happens before putting the user into the core app experience, with the idea being that these steps will educate a new user and make them more likely to successfully use the app and stick with it long term. 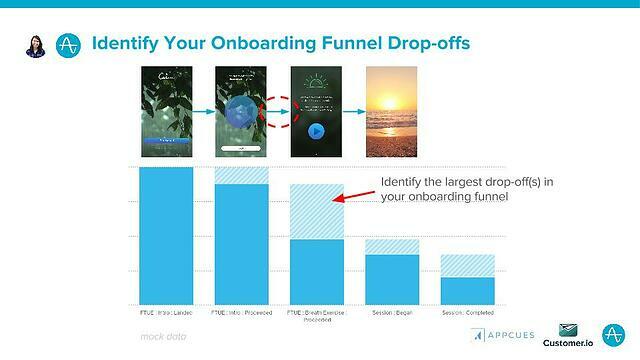 Here’s what the funnel for their onboarding looks like. Now funnels are really useful because they show you what percent of users are moving from each step to the next. Here we can see that the biggest drop-off is for the Breath Exercise: Proceeded step. Almost half of users aren’t finishing the short breathing exercise and moving on in the process. The funnel shows us that out of all these steps, the breath exercise is the one we should focus on improving first. For your onboarding funnels, when you find your biggest drop-off points, that’s where you want to dig in and figure out why that’s happening. Is the onboarding too long? Is it confusing? Or, could it be that users aren’t finding value in what you’re showing them? I also want to quickly point out the importance of segmenting your users—any time you’re looking at your analytics data, you should segment by user properties like location, platform, what version they have, and so on. 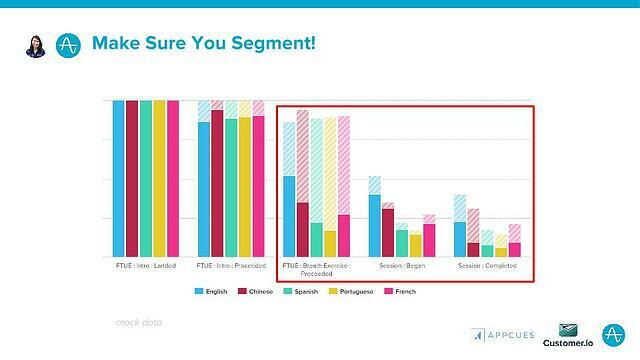 Here you can see that if you segment Calm’s onboarding funnel by Language, there are some pretty big differences for the non-English languages, which indicates they may want to focus on improving the non-english experience to improve their overall conversion. This kind of information is completely obscured if you don’t segment your funnels, and you might miss out on something really important. It’s never too early to start communicating to specific user segments about key actions. Even as early as your welcome email, you want to get as relevant and specific as possible to optimize the chances that people get up and running as soon as possible. But one of the most common mistakes in emails is cramming everything into one message and hoping for the best. That’s not effective because it’s hard for the reader to parse what’s relevant and motivating. The more you try to appeal to everyone by trying to cover all possible bases, the more likely it is that you won’t connect with anyone. That’s what happened in this old welcome email from one of our customers Clearbit, which is a BI tool. They have 3 different user personas: developers, marketers, and sales people - but Clearbit tried to address everyone with the same message that talks about a bunch of use cases that don’t make sense together. and that mash-up of information makes it really difficult for one person to figure out what Clearbit is and how it will help them do their job. A marketer might not be capable of writing scripts while a developer probably has absolutely no interest in sales activities. 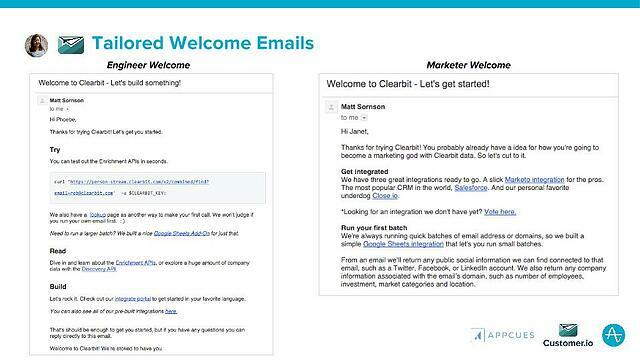 So Clearbit started segmenting their welcome emails based on those 3 user personas - and because the messaging becomes so much more focused, it’s much more persuasive and exciting for the user. You see on the left, the new engineering welcome email and a snippet of the marketer welcome email on the right. The engineering one focuses on setting up the integration and trying out the first API call - and the language is all around building something cool. Plus it’s pretty short. The marketer one is about becoming a marketing god with Clearbit data and talk about the pre-built integration and lookup tools that marketers can try out without super technical help. Clearbit uses their own tool to feed in role data, but you can use any data you have on signup to create tailored messages like this from the very beginning. When it comes to onboarding, the job is not really complete in your first run experience. 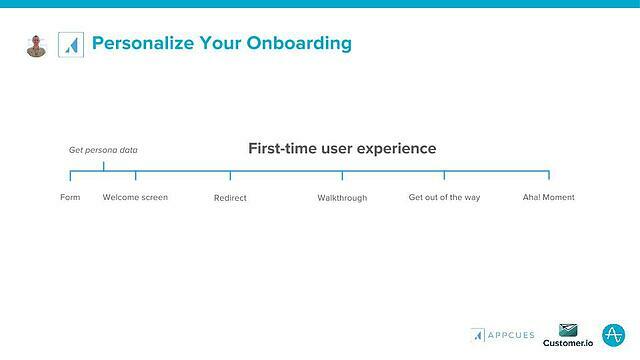 Onboarding is about turning every new user that you have into your very best power user—those users who evangelize your product, uses every last feature, and is a 10 out of 10 when you measure NPS. That can’t happen in within a 24 hour window, so we want to implement strategies within the first 90 days to continue deepening engagement. They work! These checklists use a psychological phenomenon known as the Zeigarnik Effect which essentially means that an uncompleted task will weigh on our minds more than a completed one. In fact, I signed up for Quora over 5 years ago I believe and I am still yet to do open of these. My checklist setup is still there. Still bothering me everytime I log on and learn. 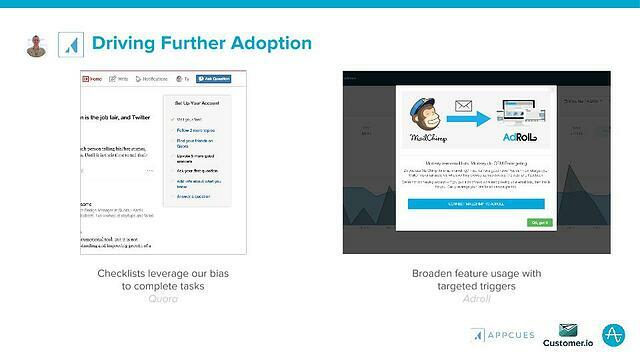 And here’s another example from Adroll… AdRoll uses Appcues to encourage its users who they know use MailChimp to turn on its integration. 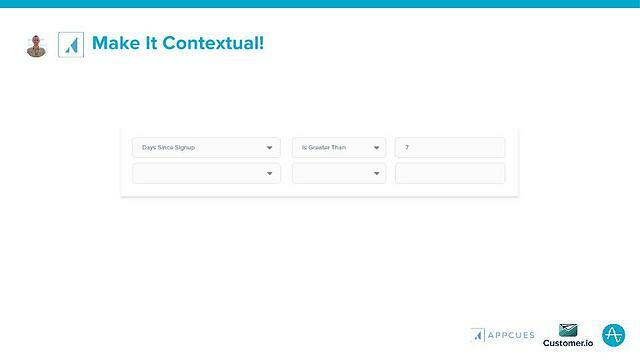 Over 80% of users who see this modal go on to activate the integration, resulting in a far higher activation rate than when AdRoll was only relying on alerting users via email. Whether or not you use a tool like Appcues within your product, you want to ensure that your product experience is contextual based on the behavior that your users have or have not done thus far. Now, Jackson has talked a lot about the importance of getting your users to their aha moment, so now I’ll show you how you can actually find what your a-ha moments are. Probably the most famous example is Facebook’s. Back when Facebook was still pretty new, they weren’t sure what the most important behavior was for new users, so they tested a bunch of hypotheses to see what had the biggest impact. Was it filling out the profile, or posting on walls? It turned out the behavior with the biggest impact was adding 7 friends in the first 10 days. Based on that data, Facebook was able to focus in on just that key action and optimize the early experience around adding and discovering friends. So how do you find your own aha moment? The key is to look for behaviors that are different between your retained and churned users. 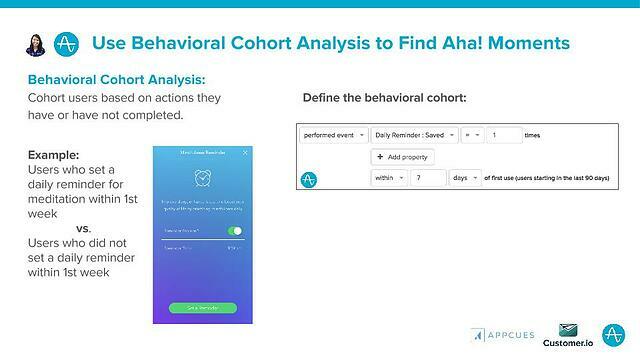 To do that, you can use a method called Behavioral Cohort analysis, which means grouping users based on actions that they have or have not completed, and then seeing how those behaviors impact retention. For example, Calm had a feature where you could set a daily reminder for a meditation session, but it was hidden on the Settings page and less than 1% of people were even finding that feature and setting a reminder. They weren’t sure if setting a reminder would actually be a useful feature, so to find out, they made a behavioral cohort of users who set a daily reminder within their first 7 days in the app—you can see how they defined that cohort on the right of the slide. When Calm looked at that cohort of users who set reminders, they actually found that they had almost 3 times higher retention than other users, which is huge. So, they decided to do an experiment bringing this reminders feature to the forefront. After someone completed their first meditation session, they showed them this screen to encourage them to set a daily reminder, bringing them to the aha moment. This update caused way more people to set a reminder, and the great thing is that those users also had about 3x higher retention, as you can see in the retention curve graph on the right, which shows what percentage of users are coming back to the app each week after 1st use—this higher retention is still holding even at Week 12 after a user joins, which is pretty significant. These experiment results showed that setting reminders actually had a causal relationship with higher retention. By using behavioral cohorts, Calm was able to see how the action of setting a reminder impacted retention, and then use that insight to make a product change that resulted in higher overall retention! So you can take everything you learn about all the major activity drop-offs and high value actions from behavior-cohorting and figuring out your aha moments. 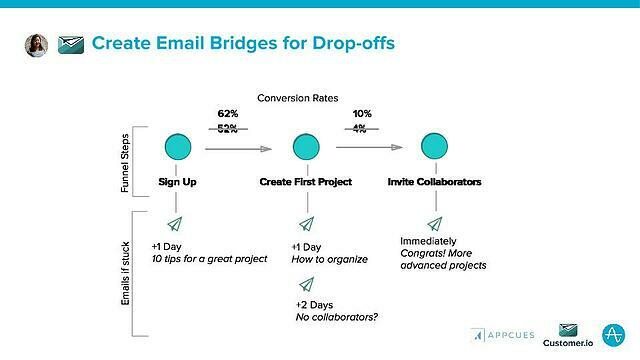 And then use behavioral email as a way to bridge those gaps to increase the conversion rates for these aha moments and ultimately improve retention. Let’s look at an example of how the company StatusPage.io does that. So StatusPage.io identified 5 key features that they wanted people to use and set up behavioral emails to nudge users to use those key features. Each pair of emails corresponds to a single feature. And the second email in the pair is conditional, so that it only gets sent if the user didn’t carry out the desired action. There are 2 really cool things that StatusPage accomplished here. If you notice the time frame, you’ll see that StatusPage is still winning and activating customers, even up to 90 days after first signing up. 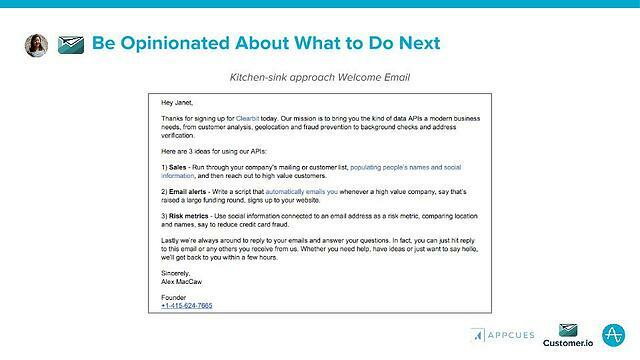 2nd is that these emails helped them increase their conversion rates from free to paid account from 5% to 12%. There are few types of mistakes that companies make with these type of nudge emails. They put a bunch of goals into one message so that it’s not clear what to do next. Or they don’t use behavioral triggers—which means that people get messages that are out of step with their reality—asking them to complete tasks they’ve already done or just isn’t the right time to do. You can combine the idea of behavioral triggers and drip emails by sending out a series of behavioral emails that all work towards one goal. You saw StatusPage do it with their feature-based onboarding emails. 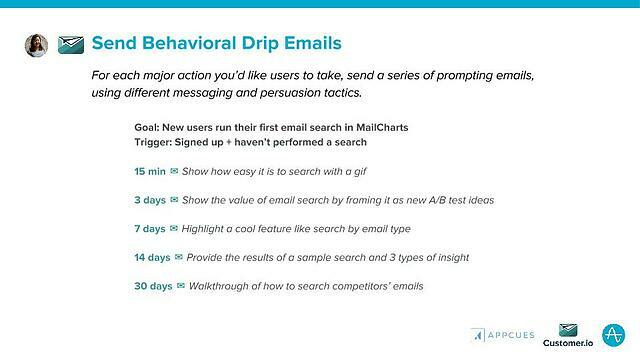 Here’s an example of a drip series for one behavioral goal from MailCharts - which is an email intelligence tool. They want their new users to use their email search feature so they send this series to nudge that one behavioral goal. You might get 1 or 4 or none of them, depending on your behavior. The trick to not annoying people is to change up the content, continue to provide value by helping people do their jobs + switching around the messaging. You can see that here with the different ideas and workflows the emails show. So we’ve already discussed your first-run experience and how to get users deeply engaged in their first 90 days after signing up for your product. But of course all of your products are continuously evolving and you want to make sure that your existing group of users will find ways to derive value out of them as they change. There are great ways of doing that inside of your product. We all work very very hard on our new product launches and feature launches and a lot of times we go back to the standard playbook of shooting out an email blast and publishing a blog post about the new feature that we’ve worked so hard to launch. A great way to augment that is to put in an announcement and an onboarding experience to alert users about the new feature, tells them about how it will improve their product usage, or improve their lives. And of course gets them using it in a way that gives them value. 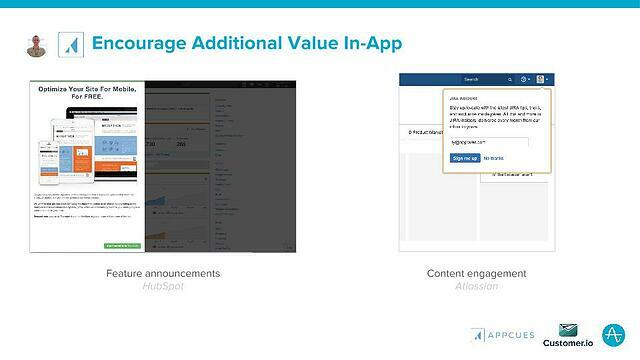 Above is an example from an Appcues customer, HubSpot. They used Appcues to build this experience inside of their product, which actually accelerated the adoption of their new COS product by 171% as compared to email and account manager outreach to do so. And on the right we have a pretty simple prompt that the Atlassian team uses inside of JIRA to encourage users to sign up for their email newsletter. Even if users are deeply engaged with your product, there could always be other opportunities to deepen engagement with your company as a brand. For this later in lifecycle stage of retention, I want to talk about a group of users that doesn’t get enough attention: resurrected users. 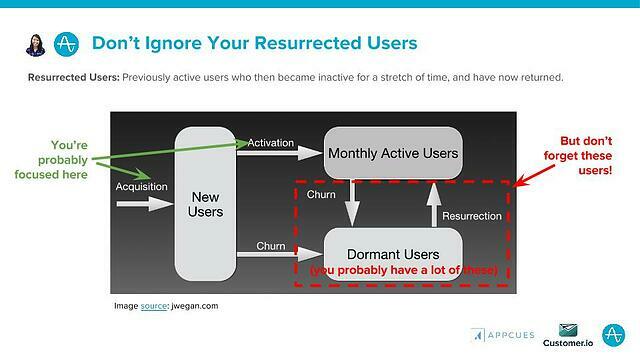 As you can see in the diagram, resurrected users are people who were previously active users, then became inactive for a stretch of time, and have now returned to your product. Now, my guess is that most of you are focused on acquiring new users and activating them to become monthly active users. But there’s not a lot of focus on users who churn and become ‘dormant’, despite the fact that this is probably a pretty large population for you to potentially re-engage. You’ve already spent the time and money to acquire these users, so it makes sense to determine what this population looks like and whether it’s worth dedicating resources to. 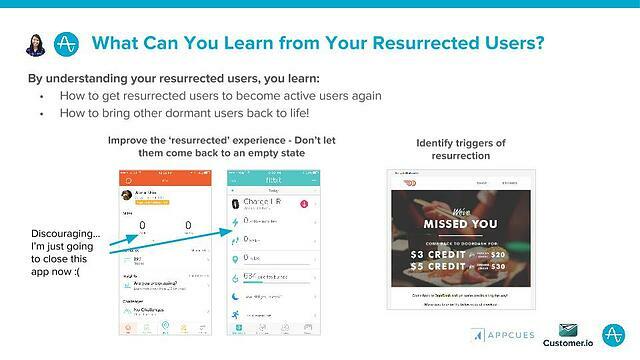 What Can You Learn from Your Resurrected Users? Now, there are 2 really important things you can learn from understanding why resurrected users are coming back and what they’re doing. First of all, you can figure out how to nudge them back to being habitual active users, which will lift your overall retention rate. The second important aspect is that you can also learn how to bring other dormant users back to life. One step you can take is to improve the ‘resurrected’ experience—when someone opens your app or comes back to your product again after a long time, if it’s an empty state and there’s not much for them to interact with, they might just close the app and never come back. These examples on the left are from my RunKeeper and FitBit apps...as you can see, I’ve been slacking off (slash not wearing my Fitbit) for a couple months now. When I open these apps and see a bunch of big zeros, I’m not really motivated to get started again. Instead, these apps could try having a screen that welcomes me back and encourages me to get going again, maybe by showing me my friends’ recent activity or pushing me to create a new goal for myself. Another way to encourage resurrection is with external triggers. Here’s an email I got from DoorDash after not using it for a few months—they’re offering me credit if I come back and place an order. Now, you want to be careful with campaigns like this—it’s really important to look at downstream retention. Maybe most people who receive this offer will come back and complete 1 order, but the question is, will they keep placing orders after that? If not, this offer only gives you a short-term bump and can actually be detrimental in the long run if users start to expect discounts and only order when they have them. Now, these are just a couple ways you can think about improving the experience for resurrected users and encouraging more dormant users to come back. Overall, it’s important to look at your analytics data and understand what percentage of your overall total user base this makes up, how they’re behaving in your product, and how you can leverage that information to increase resurrection. I’m glad that Alicia covered message examples like winback or resurrection emails. Typically we think about inactivity as a trigger in later parts of the lifecycle. But today I want to talk about positive activity emails, reinforcing habits that have been built and reconnecting your product’s value with the motivations and goals of the user. 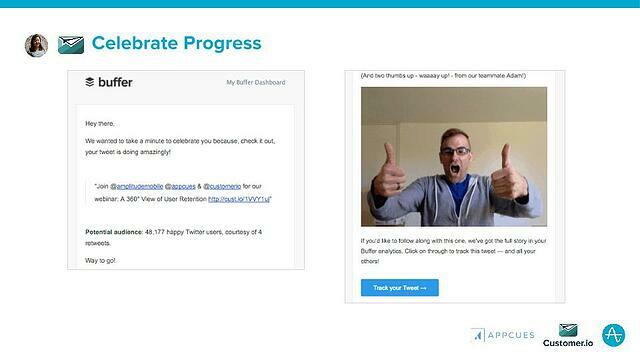 We’ll take a look at 2 positive retention emails from Buffer. Buffer is a social media sharing and scheduling tool—and they trigger an email when your social media queue runs out of scheduled posts. They know that as long as there are posts in the queue, users are getting value out of Buffer. This is actually a really helpful notification to get if you’re a Buffer customer—because it’s easy to lose track of where you are in the queue. This way, you don’t have to worry. The messaging here is great too—because it taps into the users’ initial motivations to grow fans and followers. It’s positive and makes the reader feel good, encouraging them to keep up the great work instead of a fear-based message of “go add more posts so you don’t lose all your followers.” Then they offer really simple ways to add more posts to your queue. Next, we’ll look at one more email from Buffer. Here you’ll see that one of our tweets about this very webinar was one of our most successful posts - and that made me feel great because it’s one of my goals as a marketer to spread the word about this webinar and get lots of engagement with my tweets. And people love seeing that they’ve done a good job or something has turned out really well. It’s so great these days to get a notification of something positive that also actually matters to you. I’ve been a Buffer user for years now and this email still makes me happy. In the first stage, use your data to make sure your first-time experience is unique based on your users personas. In other words, personalize it. In your new user stage—the second stage—don’t just bring users to one Aha moment, but consider multiple Ahas and drive them there throughout their first ninety days. And beyond that, keep your momentum going by peppering in doses of motivation and additional value. That should not only bring users back for more, but it should eventually help you drive upgrades later on in their life-cycle.